Bellissimo Deluxe BV-120 Violin Outfit Description: Specs: Handcarved Solid Spruce Top, Maple Back,Sides and Scroll, Maple Bridge,Graded Ebony Tailpiece w 4 Fine Tuners, Graded Ebony Pegs, Graded Fingerboard and Chinrest. Shop Setup and Adjusted with D'Addario Prelude Strings. Accessories: Violin, Oblong Suspension Violin Case, Brazilwood Violin Bow and Super Sensitive Rosin. 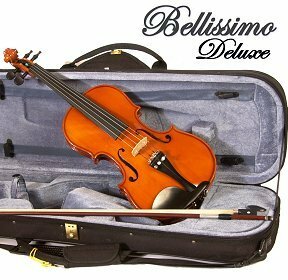 Bellissimo Deluxe BV-120 Student Violin is a step above our basic student model and will provide better performance, playability and tone. Shop setup with quality D'Addario Strings and Ready to play on arrival. Buy Now, EZ-3 Payment Plan or Rent-To-Own. We can ship your violin anywhere in the USA! Order Online Now. Click Here to Play a Violin Sound Sample.